Description: Stem is without hairs (glabrous) on an unbranched tendril. Flower corolla 1.5–3 mm wide, shallowly cup-shaped, cream coloured. Leaf: Leaves are highly variable versions of the palmate form, generally deeply lobed; central lobe generally longest; upper surfaces dotted with white glands. Habitat: Creosote Bush Scrub, canyons, washes. Notes: Photographed Feb. 16, 2008, in the desert, south east of Joshua Tree National Park, just off Interstate 10, Calif. Perennial herb that is native to California. 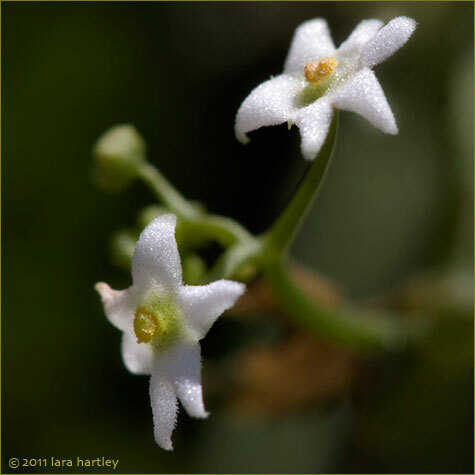 This genus is named after California botanist T.S. Brandegee. The single species in the genus is named after Dr. Jacob M. Bigelow who, in the 1850s, collected hundreds of plants in California. Perennial herb that is native to California and is also found outside of California in sw Arizona, Mexico. Photos tips Most digital point-and-shoot cameras have a macro function - usually symbolized by the icon of a little flower. When you turn on that function, you allow your camera to get closer to the subject, looking into a flower for example. Or getting up close and personal with a bug. More on desert photography.